The Miss Rodeo America Pageant is judged on the basis of personality, horsemanship and appearance. Contestants take a test, participate in interviews, answer impromptu questions, present an extemporaneous speech, ride horses provided by stock contractors, and model a variety of western clothing. 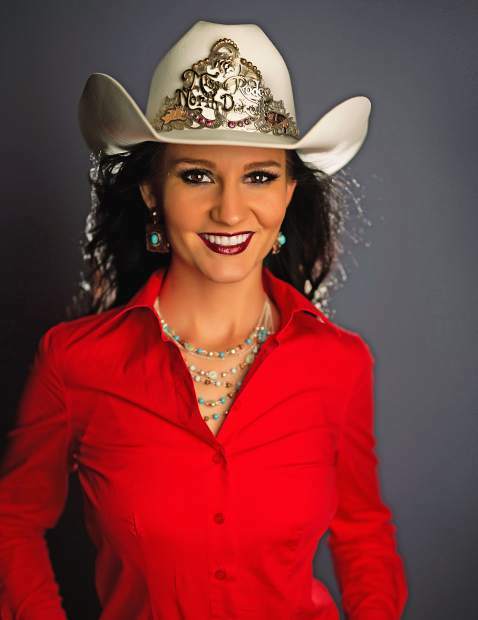 Haag aims to become North Dakota’s third Miss Rodeo America. The state’s last national titleholder was Bowman’s Ashley Andrews in 2007. The public can follow the national competition via http://www.missorodeoamerica.org and associated Facebook pages. Haag has been taking online classes from South Dakota State University, Brookings, majoring in allied health. She also works for Community Options of Bismarck, assisting people with special needs. Megan earned an associate’s degree in 2015 in mass communication from Bismarck State College and is a 2012 graduate of Kulm Public High School. She plans to pursue a career as a marketing consultant for a North Dakota healthcare provider. Haag was active in the North Dakota High School Rodeo Association, competing in barrel racing and pole bending, as well as local horse clubs. Her parents are Keith and Kathy Haag, Fredonia. For more information about the Miss Rodeo North Dakota program, visit http://www.missrodeond.org.